Free Halloween shipping labels in fillable PDF label templates printable on your laser and inkjet printer. Each design available in two different type templates, each label cell for different information and autofill. The autofill will allow you to place your info in one label cell, hit tab and the complete template will populate with that info. Use Worldlabel.com Product number WL-125 (same size as Avery® 5163) to print. 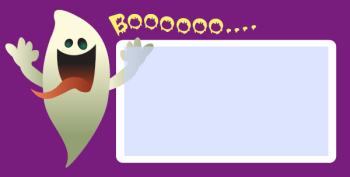 Specs: These PDF Halloween labels are cross-platform and application independent. They will work on Mac OSX, Linux, Windows, Solaris and other operating systems. There can be compatibility issues among different PDF Readers. For optimum performance and full use of all functions, we recommend you download the free Adobe PDF Reader version 9. This entry was posted in Labels & Printing and tagged labels on October 15, 2009 by wlmanager. The bat one is linking to another website.